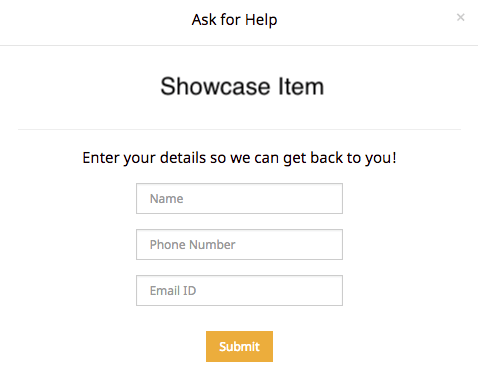 How to add Ask for Help Form on Product Page? You want to create a form in a pop-up on the product page of your store that your customers can fill to seek information about the product. Click on Add New button in the top right corner. Enter all other required details in the form as explained in Creating a custom form topic. Click on save to store the information. You might want to send a notification (Email/SMS) when somebody fills the form. You can configure a new Notification or use an existing one in the Settings tab and set it up to be sent when the form is filled. Now, in order to show the form in a pop-up on the product page on Storefront, you need to embed the form on the pop-up. Click here to know more about forms. How to embed forms on pop-ups?